We'll give you all the tips and tricks to qualify for a $100 reward card and maximize your savings for Frontier fiber internet, TV, and voice. Get a $100 Visa Reward card and free installation when you sign up for Frontier! Must subscribe to a new Frontier internet plan or Frontier internet package with a 2-year agreement. Frontier offers some sweet deals. We make it easy to check if Frontier deals are available to you. Where it’s available: Frontier is available in 29 states. Use our comparison tool to check Frontier FiOS availability in your area. If you’re in an area that qualifies for a free speed upgrade, you can get the 200 Mbps plan for the same price as the 100 Mbps plan for a whole 2 years with this Frontier promotion! Those who can’t sign a 2-year agreement to qualify for the free $100 gift card can still check out Frontier’s flexible no contract option. Where it’s available: Fiber is the best connection out there, but it’s not as widely available as DSL or cable internet. 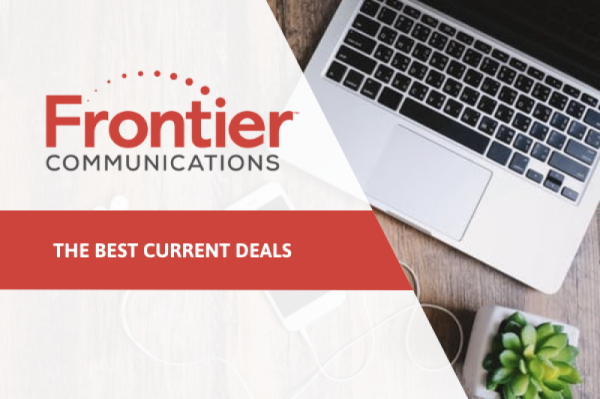 We can help you check if Frontier FiOS deals are available in your area by clicking here. Frontier bundles with internet, TV, and home phone saves you the most money since you’ll get three services for the price of two. Those who work-from-home can not only save money by having the home phone double as a business phone, but also create some work-life separation. Plus, Frontier’s 100/100 Mbps internet plan offers speeds that will allow you to upload large files, join conference calls, and download files in seconds. You get to save time and the cost of your morning coffee everyday. Where it’s available: Frontier provides high-speed internet access across 29 states in the U.S. Use our zip search tool to check if Frontier is available in your area. While live TV streaming options might seem like a better option off the bat, you won’t get the full entertainment experience and might end up paying more. For example, Sling TV Orange & Blue costs $25/mo, but you’d have to add sports, comedy, and kids packages that cost an extra $5-10 per package. With Frontier you’ll already have access to all of these live channels plus other benefits like streaming live TV channels or play back your recorded shows on-the-go. *Visa Reward Card offer and redemption requirements: Customer will be sent notification letter with redemption requirements. Customer must redeem reward card w/in 75 days after notification letter mail date. Reward Card(s) delivered within 3-4 weeks after redemption to customers who maintain qualifying eligible service(s) for minimum of 90 days after installation date and have paid first bill in full. Card expires at month-end 6 months after issuance. No cash access. For cardholder agreement, go to rewardcenter.frontier.com/myreward/agreementFSV.pdf. Frontier Reward Card issued by U.S. Bank National Association, pursuant to a license from Visa U.S.A., Inc. Limited-time offer for new residential Vantage by Frontier Single Play customers in select areas of CT, MN, NC, SC, IL, OH and NY. Must subscribe to a qualifying package of new Vantage High-Speed Internet with max speed range of 18 Mbps to 25 Mbps. Higher speeds available in select areas only for an additional monthly fee. Maximum service speed is not available to all locations and the maximum speed for service at your location may be lower than the maximum speed in this range. Service speed is not guaranteed and will depend on many factors. Service and promotion subject to availability. After 24-month promotional period, then-current everyday price applies to all services and equipment. If customer cancels one of the required bundled services during promotion, all promotional rates are void. Cannot be combined with other promotional offers on the same services. Equipment, installation ($75), taxes, governmental surcharges, and fees, including router fee ($10/mo. ), Internet Infrastructure Surcharge ($3.99/mo.) and other applicable charges extra, and subject to change during and after the promotional period. A $9.99 broadband processing fee upon disconnection of service applies. Equipment delivery/handling fee of $9.99 applies. Minimum system requirements and other terms and conditions apply. Standard charges apply for jack installation, wiring and other additional services. All prices, fees, charges, packages, programming, features, functionality and offers subject to change. VISA REWARD CARD Offer: Must subscribe to a two-year agreement with maximum $100 early termination fee on new Internet service. If customer cancels one of the required bundled services during promotion, all promotional rates are void and early termination fee applies. Frontier reserves the right to withdraw this offer at any time. Other restrictions apply.